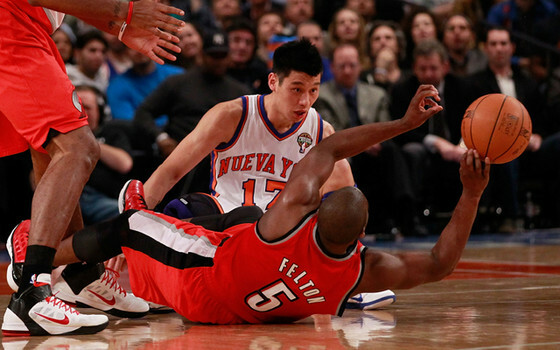 #knickstape » Felton Better Than Lin? Raymond Felton will be re-joining the Knicks and working with Jason Kidd at the point guard position next season. As all competitors believe, they are better than any other player unless the player has far superior talents (ie. LeBron James). 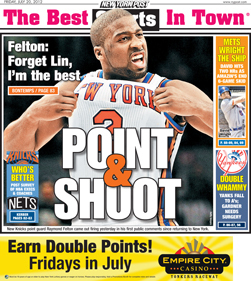 Felton has stated that he thinks that he is better than Lin. I would like to feel the same way especially how he and Amer’e meshed during his first stint with the Knicks. Felton is the more versatile player, makes better decisions, and plays better defense. Lin is more explosive, exciting, and unpredictable. I also think that Felton has reached his potential as a player, but we have yet to see what Lin can do. Felton has more years in the league than Lin, so he has more experience. Lin’s first real action as a player was the Linsanity run. Though Lin made many mistakes, we continued to see the growth in his game. Making mistakes is apart of the game, but we do want to see too many of them. If the plan for the Knicks is three years or bust, the player to get you there sooner might be Felton. If the plan is to have a recognizable player for the next 6-8 years, the player might be Lin. Though Melo is a household name, Lin’s name has reached more households then the entire Knicks roster combined. Felton’s name reached more households while he played at UNC than the NBA. I can convincinly say today that Felton is a better point guard than Lin and in a pickup game I am choosing Felton to work Lin out. In the next 2-5 years (without injuries), I can see Lin greatly surpassing Felton’s game even when he played his best.